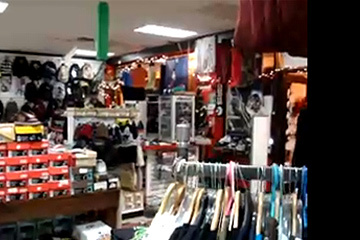 MORE ABOUT Adrenaline: Adrenaline skate shop is an independently owned business in its 6th year in Peoples Plaza. With the addition of the 17,500 sq ft skateboarding park inside the Glasgow Rt. 40 park, there has never been a better time to grab a skateboard. We have everything you need to build a custom skateboard, or get a quick preassembled board, or just swap out old parts for new parts. We carry all of the best brands of clothing and footwear in skateboarding- DC Shoes, Volcom, Obey, Osiris, Hurley, Famous, Rogue Status, Lakai, DVS, Globe, C1rca, Etnies, Nike 6.0 and SB, Matix, Neff, Supra, Kr3w, and more. We also carry an extensive line of accessories such as sunglasses, hats, headphones, backpacks, and skateboarding dvds. We are bringing in a little something for everyone this holiday season, so please stop by and say hello to our friendly staff and take advantage of some of the great sales we have going on. We appreciate everyone who comes through, Thank You.